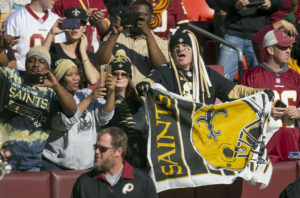 During the New Orleans Saints’ ill-fated march through the playoffs, national media dove into a story about the team’s unique relationship with its city and fans. But as when a chef from outside Louisiana makes jambalaya or gumbo, the flavor of such stories can be a bit off. Many teams have enthusiastic and even fierce fan support. Others may consider their teams an integral part of their city’s identity. But no city’s fans combine whimsy, wildness, and an almost desperate love for their team the way fans in New Orleans do…. Alas, I see the rest of this article is behind a firewall now. I hope you see fit to subscribe to the Examiner, so you can read the whole thing. Sorry about that! Not my doing.